Welcome to Pomegranate Studios, the Art of Carol Racklin-Siegel. 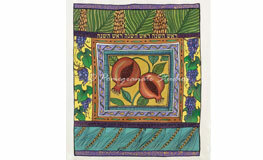 Carol is an accomplished textile artist who has directed her talents to painting biblical illustrations and Judaic art. 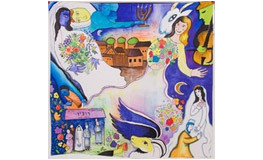 Carol uses the Serti method of painting on silk, which results in vivid colors and whimsical graphic portrayals of biblical scenes and Jewish symbols. 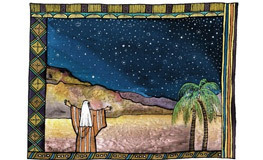 Many of the biblical illustrations were produced for the EKS Publishing series of bible stories for young readers. All images are available as prints or for licensing. In many cases the original silk paintings are also available to purchase. Please contact Carol for further information.